"A real life bodybuilding & fitness workout system to build up muscle mass fast & easily - that brings real results to real people like YOU - FOR FREE"
I want to get the X-Adaption eBook and the 3 week email training course for FREE to gain my next 7 pounds of muscle mass. Please fill out all fields below. After this press on the button to receive the eBook within minutes via Email. NOTE: A red asterisk (*) denotes mandatory items. it's about 2 years ago when my friend Frank approached me with the following..."Well Oliver - I know you've helped a lot of people with your personal training - In my opinion you are the most successful personal trainer here in Germany ever. I know your books - and I know that a lot of people have read your books - but will you ever know if the majority will ever do what you are preaching in your books? Are you really sure that helped a lot of people besides the ones you personal trained?" Well I must say I couldn't forget what Frank stated. It held me away from sleeping that night. I always had the intention to help anyone who wants to get helped in building up muscle mass or dropping bodyfat levels. But Frank reminded me on the fact that I would never know for sure what I can do for my dear bodybuilding friends, by just releasing a few books. So I decided to write a new book only for online release where I stay in contact with all my readers. A book with a workout routine that should put on as much muscle mass in three weeks as humanly possible. What happened astounded not only Frank. I really enjoyed hearing all these success stories. It was and is still amazing and motivating for me. But to make a long story short - I decided to let this book get translated into English to help even more people around the world putting on a serious amount of muscle mass within three weeks. So this is the part where you come into the game. 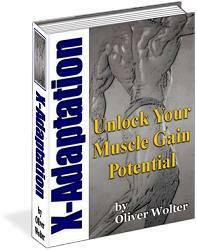 I will give you my book X-Adaptation as long as the three week training course for free - just for the asking. All I want from you is a god honest feedback after this three weeks how it worked for you. That's all - no obligations whatever. I can guarantee to you: during your first training unit, you will know that something crazy with your muscles is going to happen. P.S. I don't want to stop with just the X-Adaption book + course. I also frequently update the articles section where you can find articles that should help you. P.P.S Just fill out the form above to receive the X-Adapation ebook within a few minutes via Email. If you want enormous strength, tightly defined muscles, a massive chest, powerful arms and legs, "X-Size" the computer fitness software is a must. This software is the most effective muscle producing program ever developed. Three or four months with "X-Size" training will have anyone pulling 20%, 30%, even up to 70% more weight with less effort than today. Take a measurement tape - lay it around your waist and if you've got less than 42 inches of waist - then this system will cause such an intense fat burning "metabolism shift" that you'll have a perfect six-pack of abs in less than 3 months from now.